AKUT-SKAT is in charge by Gesellschaft für Internationale Zusammenarbeit (GIZ) GmbH to cooperate in the field of Energy Efficiency in Water Supply (ProEESA) in partnership with the National Secretariat of Environmental Sanitation of the Ministry of Cities of Brazil and the Federal Ministry for Economic Cooperation and Development (BMZ) of Germany. In 2014, the Brazilian water and sanitation utilities spent USD 1,1 billion on electricity, consuming 12.74 terawatt-hours (TWh). This matches the annual domestic consumption of 22 million people. According to Brazilian National Information System on Sanitation, SNIS, the water utilities energy consumption is on an upward trend. This has an adverse impact on the climate due to the greenhouse gas emissions from generating electricity with fossil fuels. The sector faces the challenge of providing more and better water and sanitation services to Brazil’s rapidly growing population, while introducing efficiency measures to keep its energy consumption levels constant. Water utilities access financial instruments that have energy efficiency requirements for planning new infrastructures and refurbish existing ones; Cost analysis and studies on potential savings are considered in technical measures or sanitation sector policies; Improved coordination across the water and energy sector institutions regarding energy efficiency initiatives; Managers and technical engineers improve their abilities regarding energy efficiency management. 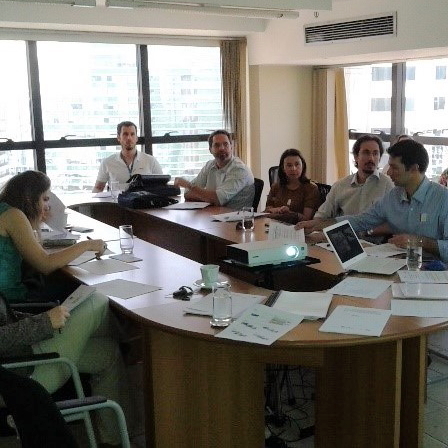 The project supports the integration of energy efficiency aspects in financial instruments, and it promotes a dialogue across the water and energy sectors, in which key actors can share ideas and information about methodological tools and instruments for promoting efficiency. In several areas, the project provides technical assistance; it also supports improvements in the availability of information, and conducts awareness-raising campaigns and capacity building measures. Organization of National Seminar about Energy Efficiency in Water Supply.